The children at Highfield St Matthew’s School were filled with excitement when Andy Baxendale and others from the Widows Sons Masonic Bikers Association donated a friendship shelter and went in for the day to talk about the importance of reading, to explain about their organisation, and of course, to talk passionately about their bikes. The bikes in the school hall waiting for the children. At the end of the visit, the children were not only delighted with the friendship shelter but also thrilled that they got to sit on the bikes. The friendship shelter was an idea of the children, who wanted a place for those with no-one to play with to go where they could find company and friendship. Andy and his team were keen to step in with the money, but also share their experiences with the excited youngsters. 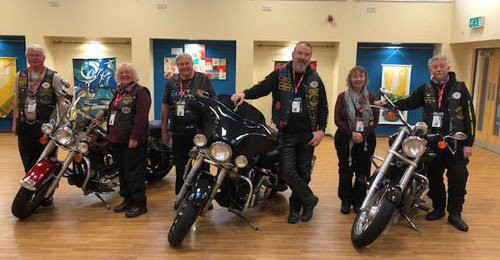 Widows Sons was originally chartered in the USA in 1998 and now has 150 chapters across the USA and Canada, all being Masons, all being motorcyclists, and all enjoying their hobby and friendships to raise money for charity. In the UK, there are now 14 chapters and are recognised by UGLE. Andy explained about their goals and the wish to combine their hobby with helping out in the community whenever they can. Andy is the President of the North West Chapter. As well as their social activities and fundraising efforts, the Widows Sons also support each other Masonically, and are prone to turn up ‘mob handed’ to special events at each other’s lodges. Andy is a member of the Skelmersdale Waterloo Chapter No 1380, (commonly referred to as the ‘bikers’ chapter’ and a Royal Arch home for the Widows Sons and others interested in bikes). which meets at Ashton Masonic Hall. For the visit Andy was accompanied by Bill Bruce, first principal, with partners and fellow members. It was a great experience for all concerned and they have been invited back in the summer for a repeat performance. A small donation can make a big difference. 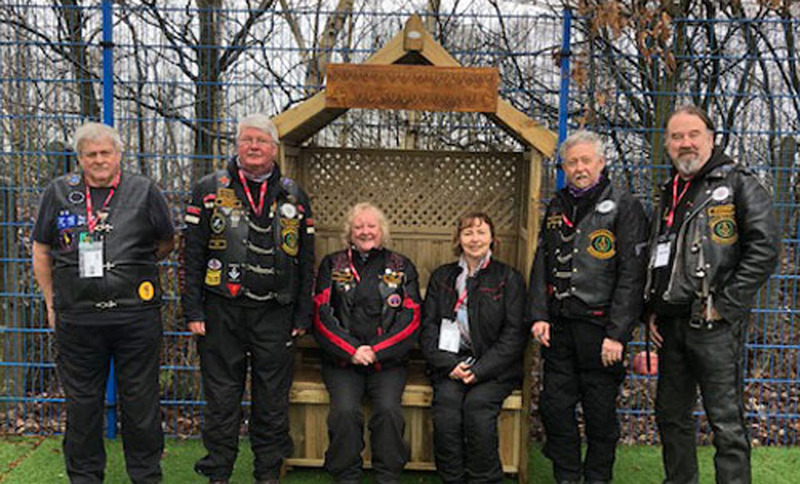 In front of the ‘friendship shelter’ pictured from left to right, are: Clive Hardisty, Bill Bruce, Elaine Bruce, Michelle Kidd, Mal Kidd and Andy Baxendale.